When I started my event design business I wanted to provide couples in my region with services that focused on highlighting community. Weddings take a village to create whether it is hired vendors or family and friends helping out. Right now I feel it is a truly great time to get married in upstate New York. As I am building my business, so are other amazing and talented friends like Flowerscout, Takk House, and True North Bridal Studio. I love the friendships and collaborations forming and all these ladies behind these business truly make a vendor dream team for any wedding. Yesterday was the first ever offbeat wedding showcase, Knotted, hosted by the Takk House in Troy, NY. Early on I got in touch with Takk House about consulting on creating an event like this and it was wonderful to see all the hard work Heidi and Frank (the minds behind Takk House) come to fruition. Couples got the chance to meet with some of the most talented vendors in the area, sample whiskeys, tour the Takk House, and listen to live bands. For my display I was inspired by topographic maps, hiking, and a quiver of vintage arrows that once belonged to my grandfather. For the darling couples that showed interest in my work I gave them a gift bag filled with some handmade goodies and other surprises. I also had some temporary tattoos for attendees to adorn themselves with! I whipped up this floral arrangement myself! Floral recipe featuring ranunculus, wax flower, and eucalyptus. Vintage arrows thrown in as well! 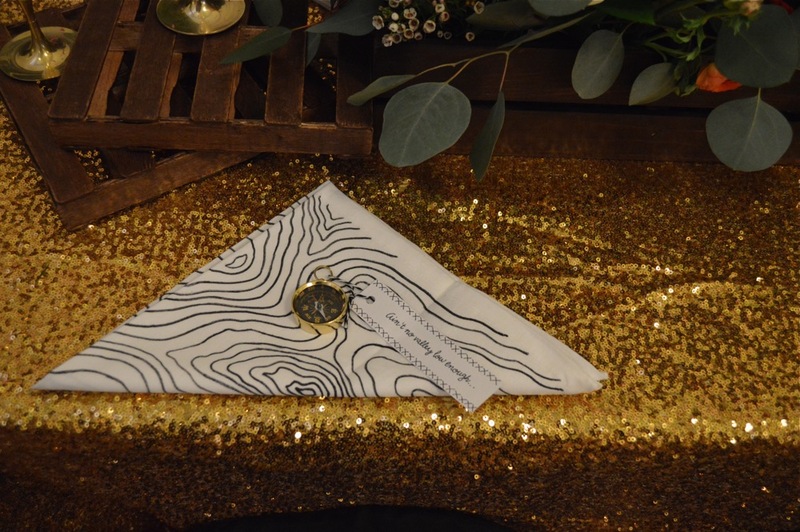 I hand painted a topographic map pattern onto the napkins and topped them with brass compasses with lyrics from "Ain't No Mountain High Enough". I constructed these mini wood pallets for the centerpiece and sewed all the bench pillows. Takk House's ballroom has these lovely dark benches running along both sides and I think a wedding would look cozy with long tables and lots of pillows! I hand painted my logo onto a piece of birch to create my booth sign and bookended it with some more vintage arrows. My gift bags for interested couples contained two hand embroidered vow booklets and a little cotton bag with some EOS lip balm so they can practice their first kiss many times over! Another hand painted sign and a tattoo bar.